Hi friends! I think it’s pretty clear we’re uh … >.> pretty chill here at ALBTALBS (A Little Bit Tart, A Little Bit Sweet). Also that blogging has become largely dictated by various aspects of my health. I’m a bit mixed because I feel like I should apologize, but also that I absolutely should not because you know. Medical issues. A) It’s absolutely not something I can control, and obviously if I could I wouldn’t be in the boat I am now. Which speaking of boats, perhaps someone should send one because holy cow all the rain of late. ANYWAY. That’s the vague update on the “state of things” currently. Now let’s get to the fun stuff which is … books I’ve read from January-June 2018. I’ve already posted Aidee and Babs‘ lists, which you should definitely check out. They had some overlap. This entry was posted in Book Talk, General and tagged 2018, 2018 Reads, Books, Broken Lime, General, Grade A, Grade B, Grade C, Grade D, Lime and Life, Lime is Sorry, Limecello, Team ALBTALBS, Team ALBTALBS Reads, Weary Lime, What We Read, What We've Been Reading, What We've Been Reading 2018 on September 8, 2018 by Limecello. Hi friends! Me again and my bad, jumping on on Babs’ list, which she :X sent me back on 7/11. I hope you’re enjoying these lists, that you can maybe add (or take!) from your TBR – and possibly find a reviewer that your book taste lines up with. 😀 Cheers! This entry was posted in Book Talk, General and tagged 2018, 2018 Reads, Babs, Books, General, Grade A, Grade B, Grade C, Team ALBTALBS, Team ALBTALBS Reads, What We Read, What We've Been Reading, What We've Been Reading 2018 on August 30, 2018 by Babs. This entry was posted in Book Talk, General and tagged 2018, 2018 Reads, Aidee, Books, DNF, General, Grade A, Grade B, Grade C, Team ALBTALBS, Team ALBTALBS Reads, What We Read, What We've Been Reading, What We've Been Reading 2018 on August 25, 2018 by Aidee. Hi friends! Today’s post is on a whim. Yes, the topic is right and true. You can ask me anything. It’s inspired by a conversation I had at RWA. Jamie Beck told me I did something nice – and to be honest I’m still not entirely convinced she meant me – and that she isn’t confusing me with someone else … but it was really nice to hear, so <3. You can feel free to ask me a question about anything else as well … but I reserve the right to not answer that. Happy weekend, and start firing off those questions! This entry was posted in Book Talk, General and tagged Ask a Blogger, Ask a Blogger Anything, Ask Me Anything, Chatter, Fair Game, General, Open Season, This Could Get Dangerous, We Answer How We Like on August 4, 2018 by Limecello. First up, the chicken salad. It’s good for fall too, although since I delayed so long apples are as in season as they were. But you know, it’s not as if apples are hard to find year round. What do you need? Chicken, celery, carrots, and apples. I’m actually not at all a fan of sweet and savory dishes, so the fact that I can recommend this says something. I was hanging out with my dad one weekend, and he had to bring food to a Bible study pot luck, so I came up with this. Of course you wash everything – so that’s not really a step. Once done, cut the celery and carrots into 2″ pieces, then julienne it. (Cut it into thin strips.) For the chicken, you can use chicken tenders (we did), or even a rotisserie chicken from your grocery store. We took frozen chicken tenders, and just boiled them. Shred the chicken. The apples, slice them thinly. I’d say halve then quarter each apple, cut out the core, and keep slicing – use a mandolin(e) if you have one or prefer using that. Add salt and pepper to taste… and now we get to the Szechuan aspect. Hmm… ok, so I guess we’ll do this. Ingredients being more specific… three medium sized apples. Probably five or six stalks of celery, and two large carrots. And a pound of chicken tenders, or half the rotisserie chicken. Now, you need and want sesame oil. Pour about 1.5 T into the bowl and mix. Add Szechuan pepper oil to taste. (If you like extra heat, add in chili oil too.) Mix. Done! Toast the szechuan pepper corns. Once they’re cooled grind them with the shitake mushrooms, and dried chiles into a fine powder. Heat the sesame oil – not to the smoking point but right before. It’ll shimmer. Dump the powdered ingredients into the pot and leave it until cooled. OR here’s an easier method: dump everything in the cool oil, cook on low, then once it starts smelling good, cook for about 10 more minutes. Once the oil is cooled, put it in a clean jar. If your heat tolerance isn’t that great, make sure you strain out most of the peppers before you bottle it. LASTLY! I discovered these Two Degree bars… they’re really good, and all natural – and what’s really cool about them is that whenever you buy a bar, the company also gives food to a hungry child. I know for sure they’re available nation wide in Whole Food stores. As you can see there are Cherry Almond, Apple Pecan, and Chocolate Peanut. I’ve tried the Apple Pecan and am saving the others – I might cave and try the Chocolate Peanut tonight. This entry was posted in General and tagged Chatter, Food & Drink, General on November 12, 2011 by Limecello. and bent the cover. >.< Nope, not a euphemism. In fact other than coming to my computer that was basically the last thing I did and that’s how my day has gone. Sick and headachy, I finally feel human, glue myself to the TV after eating something, and watch Bones and Burn Notice. So a good day other than the majority of it. 😛 My first few hours were spent tweeting and being horrified at world news and all. Recipes will have to wait for Saturday. But poor battered book. You see why I don’t do print books anymore? No space, no room, and I become a book abuser. 🙁 What about you? I think most of you read print and e? Do I have that wrong? In fact – tell me please, I’d like to know. Also, anyone else willing to share shameful secrets/confessions of book accidents? One of my friends freely admits to breaking the spines of books. I call her a book murderer. But don’t worry – I won’t judge any of you. I just like messing with her. And why you’re all here 😉 the winner of Joanna Chamber’s book is Jeanne Miro! Jeanne, please email me and let me know what format you’d like the book in by this Sunday please! (The 13th.) Just use the contact form at the top. And my last question – do you care if recipes match up? Like if I share more than one should they be able to go together and make a meal? Also, how good are we all with cooking/recipes and precise measurements? This entry was posted in Book Talk, General and tagged Chatter, General, Winner on November 10, 2011 by Limecello. Sad Day = Giveaway. And Winners! I’ve been reading Harlequin Presents, as you well know, but this week I’ve been reading a lot of them. Like, one a day. O_o Some are really good. Some are ok. Anywhere from D to B- grades. (B- is really good for me, just to give you some context.) I know there are books I need to read and review, or re-read to review… I’m just having trouble with that part. Which is why I’m “outsourcing.” 😛 Did I mention that? I’ll have to do a more formal post, but if you’d like to review for me send me a sample review and we’ll talk. I’ve also got not much else, so – if anyone wants to be in the drawing for a LoveSwept ebook, that hasn’t won one from me yet, leave a comment letting me know so. And now, the winners from many of the guest posts. They were all chosen courtesy of randomizer.org. From the guest post the lovely and wonderful Sarah Mayberry shared with us, we have three winners. They are: Brie, Jen B., and Anne Gracie. You all need to send me your addresses please – you can use the handy dandy contact form at the top. From our “official guest author of the month” Vivian Arend, Mary Kirland – you’ve won the print copy of Turn It On! For the ebooks, the winners are Bakin_Goddess, elaing8, and Cathy P. Please let me know your ebook choice from Ms. Arend’s backlist, as well as the format you want. All of the winners, please send me your information by next Tuesday, November 15 to claim your prize. Thanks! This entry was posted in General, Giveaway and tagged General, Giveaway, Winner on November 8, 2011 by Limecello. 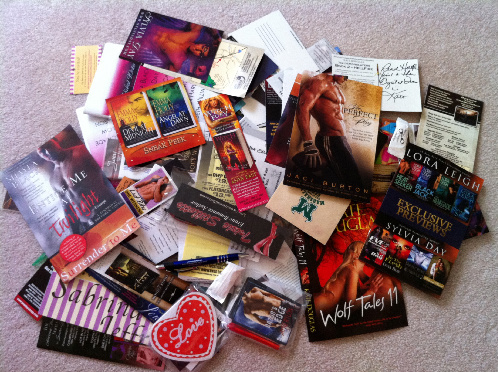 Remember, if you tell me about category romances, you still have a chance to win a signed Olivia Gates back list book. I’m going for substance now, so wow me and you’ll win. Or you know, not even just wow me, just say something of substance. So that’s what’s going on! What about all of you? Anything planned for the weekend? This entry was posted in General and tagged Chatter, General, Winner on October 20, 2011 by Limecello. Ask Me Anything! AKA Fun For Lime! Hopefully fun for you too. I’ve been wanting to do this because it seems like a cop out post.. but it really isn’t! You know all those kooky author interviews I’ve had posted? Well I love those questions. This entry was posted in General, Giveaway and tagged Ask Me Anything, Chatter, General, Giveaway, Interview Questions on October 18, 2011 by Limecello.